Males are easily distinguished from females by the red slash under the chin. 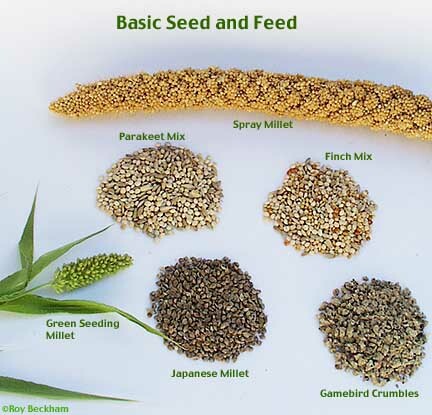 Standard finch mix (they do have a preference for the larger millets so a parakeet mix would be fine too), egg food (Roy's Egg Food) , gamebird crumbles, green food and some live food. They will also readily eat mealworms. 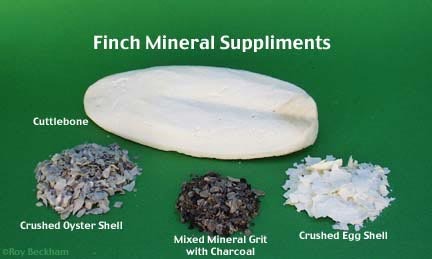 Calcium in the form of crushed egg shell, crushed oyster shell and cuttlebone should always be available. I also used a liquid calcium additive in the water or drizzled on their egg food while breeding to avoid eggbinding (Calcivet, see below). I wish I could say that I have raised lots of these. Heck, I'd like to say that I've raised even one. This one escapes me, which is kind of embarrassing considering these are considered an easy to breed species. I've had them off and on now for years and just can't seem to successfully raise any. (2002 Update: Finally, I have raised some Cutthroats. Both fostered and on their own) They would often build nests, sit the eggs, hatch the chicks and then stop feeding right at around one week. Many have suggested that this could be due to a lack of protein or live food during this critical period. It could be. My schedule would only allow for egg food feedings in the morning and evening. They eagerly ate the egg food, but my last attempts with this species ended with me hand feeding a week old chick (11 days old). Even when I fed copious amounts of mealworms, the pair abandon the nest at just about one week after hatching. If all goes well, the chicks will remain in the nest until about 18 to 21 days. The males are usually identifiable upon fledging (27 day old male) by the red slash under their chin. The breast and belly of the male matches the hens at this time. 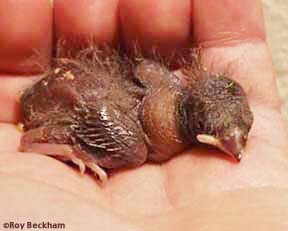 Fledglings are independent within 2 to 3 weeks after leaving the nest. Best to be safe and leave them for the full 3 weeks if not longer. 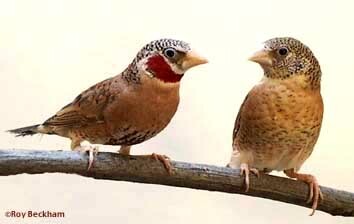 I passed my last pair of birds on to another breeder who was very successful fostering the eggs under society finches. They can be a difficult species to foster due to the differences in the begging behavior. Cutthroats stretch straight up, similar to a canary, rather than turning their head in typical estrildid fashion. 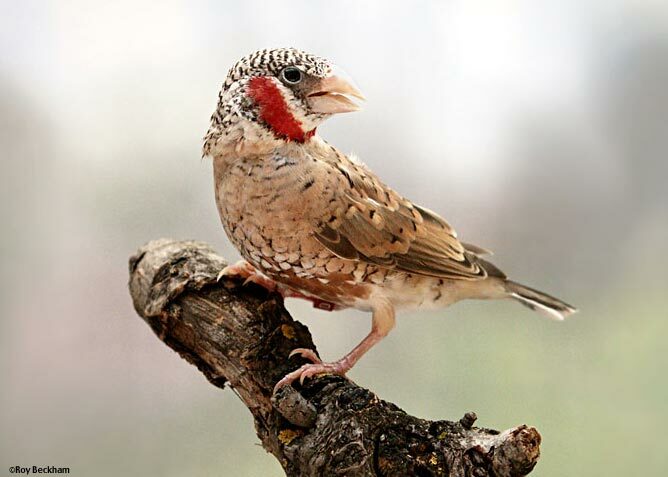 This combined with their dark skin with fuzz, different mouth markings and noisy begging from day 1, has the society finches wondering what has emerged from the egg. I believe that it is important or at least you stand a better chance of success if you allow the eggs to hatch under the societies rather than transferring chicks to the fosters. The differences from the Society's own chicks seems to put them off so perhaps seeing them come out of the egg reassures them that these chicks are theirs and not a bug that has jumped into the nest. In mixed colonies, Cutthroats can be somewhat aggressive. They can certainly defend themselves against larger species. I have seen male Cutthroats carry the hatchlings out of the nests of other species. If not breeding however, these birds can be calm and gentle in a mixed flight. Fledgling male and female. Young birds are dimorphic like the adults, but lack the breast color detail and have dark beaks. This species is listed in CITES (Convention on International Trade in Endangered Species of wild fauna and flora) appendix III. As a result, this once common cagebird has become difficult to find in the US. Even imports from Europe of close-banded birds have become difficult at best with all the additional paperwork and permits needed. Work by aviculturists is needed in the US to establish a free-breeding strain. There are several mutations developed in Europe. A yellow band that changes the red throat band to yellow, an all white bird with red ribbon, a dilute form with muted markings on a nearly white body as well as others currently being developed. I have heard of a Fawn, but not sure what that looks like or if it is firmly established. There are several known subspecies of the cutthroat of which two are seen in aviculture (A. f. meridionalis & A.f. alexanderi), but neither is very common. 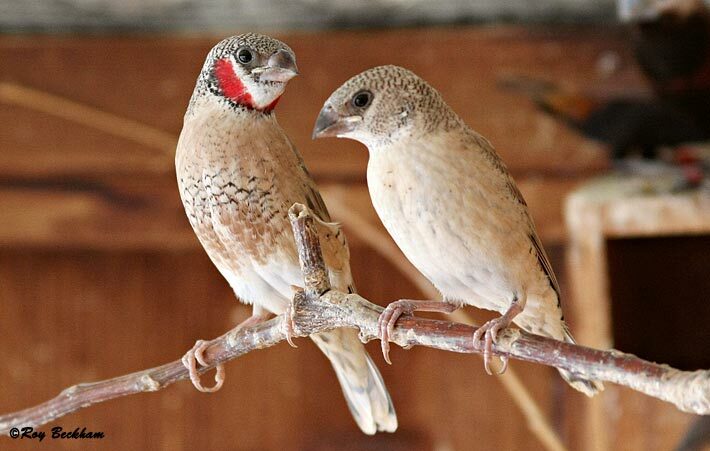 Cutthroats should not be housed with Red Headed finches while breeding. They will produce fertile hybrids. 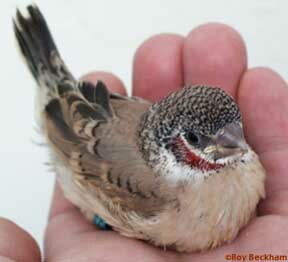 Mouth markings are similar to those of the Red Headed finch. They are easily seen as the bird has a very wide gape and stretches his head straight up while begging rather than the typical estrildid finch's bent neck posture.